I’m so excited to have Nathalie, Louis, & Parker from @cedar.stream on the blog today! 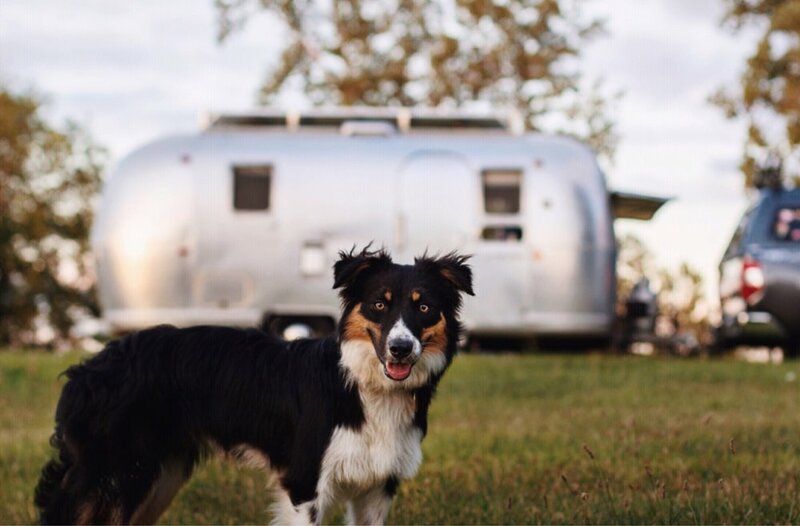 They travel full-time in their 1969 Airstream Globetrotter. The pictures from all their travels are breathtaking! I know you’ll love them just as much as we do! Today Nathalie is going to share all about their experience crossing the Canadian border with their pup Parker. The first time I saw photos of the Canadian Rockies, specifically Banff National Park, I knew I needed to go. The mountains have always spoken to me and these particular ones looked phenomenal. When we started making travel plans for summer 2018, some friends reached out wanting to meet up in Montana. This meant we would be a matter of minutes from the Canadian border. This was our chance to go north and explore those beautiful places we’d seen in photos. But what about our sweet pup, Parker? I knew we couldn’t leave her behind. I quickly started researching what it would take to bring a dog across the Canadian border. After reading a handful of web pages, we were excited to find we could bring Parker across and that she would be able to explore with us! 1-Your pet needs to be vaccinated against rabies. The little tag on your pet’s collar doesn’t count, you’ll need the actual paper your veterinarian gave you the day of the shot. The paper will list: your pet’s name, breed, color, weight, and age; your vet’s contact information and license number; and lastly, the serial number for the vaccination and where it was manufactured. If you don’t have this paper call your vet and have them send you a copy before you reach the border. Pet vaccinations are required in both Canada and the US. You never know when you’ll be asked to show proof so be prepared by keeping a copy with you at all times. 2-Open bags of pet food can’t be brought across the Canadian border. Know how much your pet needs for the duration of the visit and bring a new, sealed bag that is no larger than 40 lbs. The US is a little more relaxed in regards to pet food so if you purchased the food in the US, you should be good to bring the rest back with you. 3-Research where you can or cannot bring your pet. Dogs are allowed on most trails in the Canadian National Parks. Make sure your pet stays on leash at all times. Leash laws are for the safety of your pet, wild life, and the beautiful land you’re exploring. Now that you know the basics, I’ll tell you a little about our experience. When we got to Montana I pulled out our folder of Parker’s paperwork. After flipping through it we noticed we had a paper saying which vaccines she had done, but it wasn’t “the rabies paper” we needed… crap. The stress about whether our Canada trip would happen or not kicked in. I called our veterinarian first thing the next morning (just two days before we were supposed to cross the border) and was able to get a copy emailed to us within an hour. We were lucky to get a copy so quickly, however, I would not recommend putting it off until the last minute! We were now fully prepared to cross the border. We knew all the rules and had a plan, yet I still felt so nervous! When we got to the Canadian border we rolled down our windows, even the back ones, so Parker could say hello. We had nothing to hide. We handed over our passports, had Parker’s rabies vaccination record in hand, and waited for the officer to ask questions. I don’t know why I was so anxious about crossing! It was so quick and easy. We got into Canada, no problem. It was time to explore all the incredible lakes and mountains our hearts desired via kayak, hiking, hammock, and more, all with our little adventure pup by our side. We visited Banff, Jasper, and Yoho National Parks. They were all amazing and unique in their own ways. We met people from all over, who shared similar experiences of ease, bringing their furry friends on their travels. If you are considering bringing your pet to Canada, don’t let crossing the border scare you. We experienced things seamlessly going both in and out. Parker enjoyed all the new places we went and we could sleep easily knowing she was by our side. We are Nathalie and Louis. 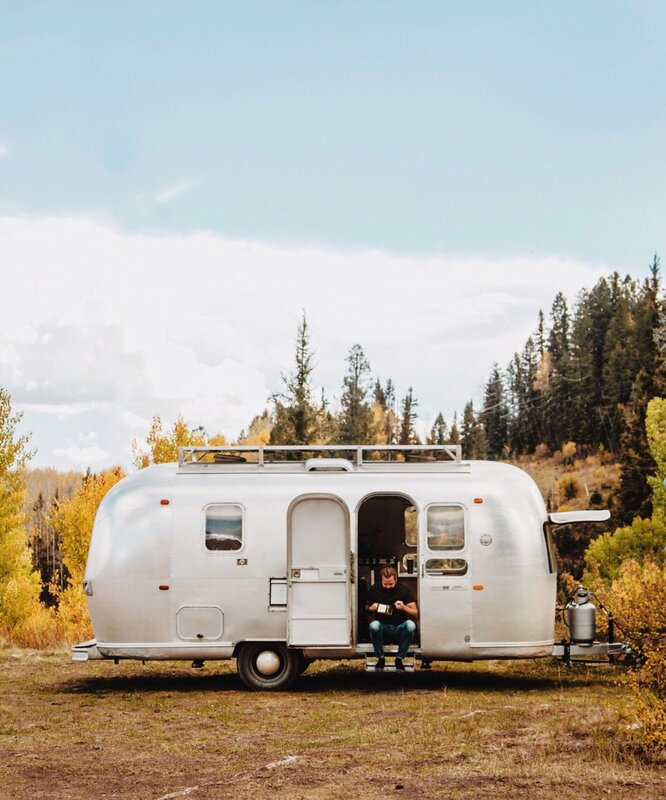 We have been traveling full time in our self renovated, off-grid Airstream for a year and a half. Louis does carpentry work on the road, while Nathalie takes care of planning and documenting this big journey we call life. We boondocks everywhere we go to give ourselves, and our very adventurous dog, Parker, a chance to explore unique places and fully submerge ourselves in the outdoors.